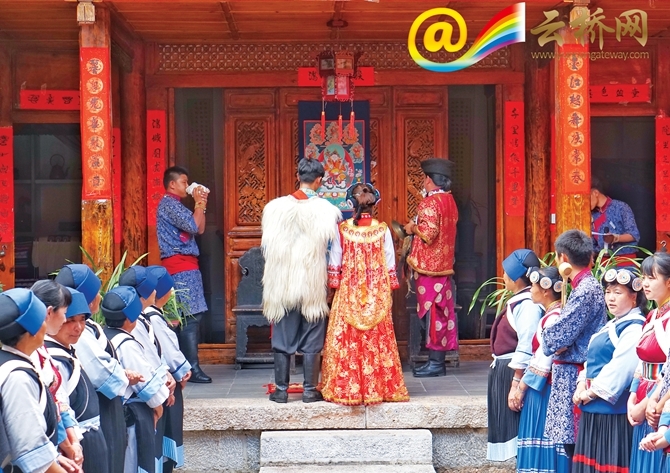 On weddings of Naxi people, the groom can only enter the home of the bride if his matchmaker can overcome various challenges including a singing battle. 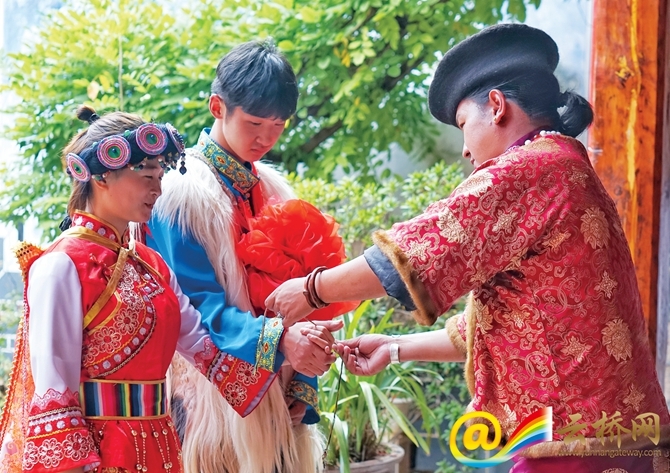 In addition, Naxi people tie the couple’s hands together and have their own “marriage certificate”. The day before the wedding, the groom will come to the home of his beloved with a big bride-escorting team in the early morning. However, the gate of the bride’s house isn’t easily opened. 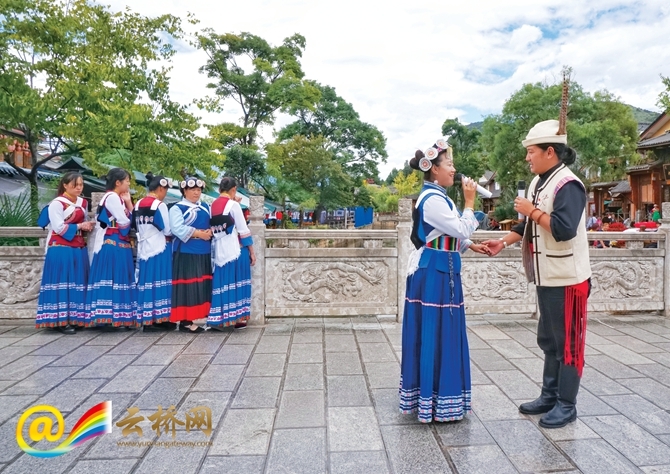 The groom and his team will be allowed in only when the matchmaker overcomes all the challenges brought by the Naxi priest on the bride’s side, including singing songs. 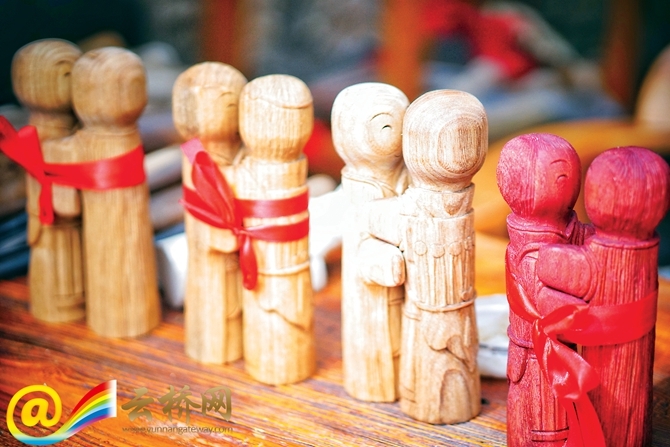 Matchmakers of Naxi Ethnic Group are of many accomplishments. Not only did they act as go-betweens, but they are seasoned in the marriage singing battles, in which the songs must be traditional ones. When the groom is finally let in, the escorting team will put all the gifts for the bridge’s family in the courtyard. If the family is satisfied, they will be moved into the warehouse. And then wine will be served. On the wedding day, the Naxi priest will tie the couple’s hands together with a red string, indicating that their souls are bound together and can never be separated. Finally, the Naxi priest will write their names on a piece of Dongba paper as symbol of marriage and handed it to them. The next morning, the bride’s mother will make some desserts for her daughter who will also receive gifts from her friends and relatives. As the newlyweds leave for the groom’s home, the bride’s relatives and friends will send representatives to join the escorting team and accompany the bride to the groom's home. On the last day, relatives and friends of the bride will meet the bridegroom’s parents-in-law. Then the groom will accompany the bride back to her original home to pick up her parents to his home where the parents on both sides can meet each other.